The four best offenses in the league — the Chiefs, Saints, Rams, and Patriots — rolled through the Divisional Round and will play this weekend with a trip to Super Bowl 53 on the line. We have one main “slate” of DFS on tap, and some playoff fantasy football leagues are just now heating up. Here are some of the best stats to know for the Conference Championship games. The Saints (+151) had the best point differential in the NFC (and entire NFL). The Rams (+143 had the second-best point differential in the NFC. The average score of Saints games was 31.5 to 22.1. The average score of Rams games was 32.9 to 24.0. Alvin Kamara score the most fantasy points per snap (0.53) among all qualifying running backs this year. He also led the position in 2017 with 0.67 points per snap. 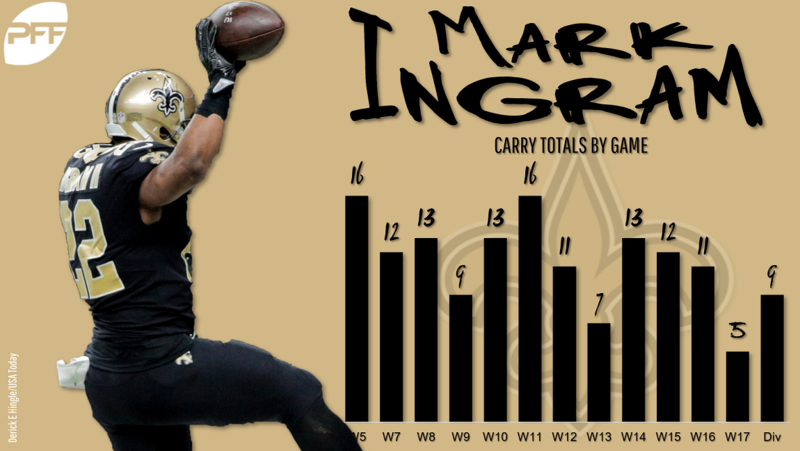 Mark Ingram saw double-digit rushing attempts in six of his first seven games this season. 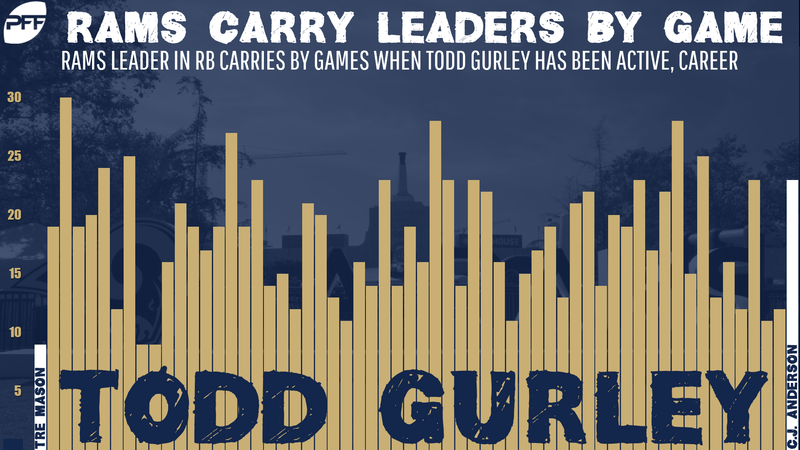 He’s had fewer than 10 rushing attempts in only three of his last six since then. Michael Thomas scored 51% more DraftKings points per game at home (25.7) than on the road (17.0). He’s averaging over 110 yards per game at home this season. C.J. Anderson (23) out-touched Todd Gurley (18) in last week’s Divisional Round win despite the fact Gurley wasn’t on the injury report. Robert Woods had at least four receptions and at least 60 receiving yards in every game from Weeks 2-16 before a limited-snap game in Week 17. He picked up where he left off last week with six catches for 69 yards. Jared Goff averaged 81 fewer yards on the road than at home this season (244 vs. 325), and his road TD/INT ratio (10/9) paled in comparison to his home ratio (22/3). When the Rams and Saints played in Week 9 (in New Orleans), Brandin Cooks roasted his former team with a line of 6-144-1 on eight targets. It was his third-best DraftKings outing of the season. After seeing at least six targets in three straight games from Weeks 14-16 (And at least four receptions in each game), tight end Gerald Everett now has no catches in back-to-back games. The Chiefs (+144) had the best point differential in the AFC. The Patriots (+111) had the second-best point differential in the AFC. The average score of Chiefs games was 35.3 to 26.3. The average score of Patriots games was 27.3 to 20.3. 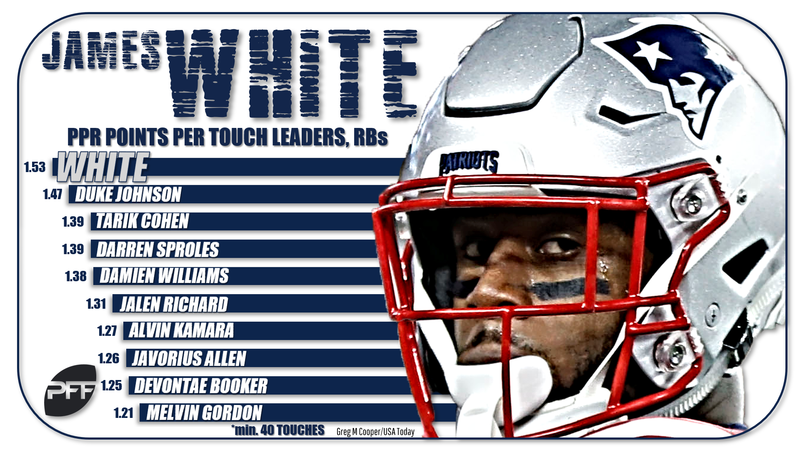 James White scored 1.53 fantasy points per touch this season, most among all running backs who had at least 40 touches. The Chiefs allowed 4.96 yards per carry to running backs this year, but Sony Michel averaged just 4.2 YPC on the road vs. 4.8 at home. He also had just one road touchdown versus eight at home in an equal number of games. Tom Brady had a better TD/INT ratio on the road (4 touchdowns for every interception) than he did at home (2.25 touchdowns per interception). The Chiefs allowed more passing yards (4,721) than any team this year while giving up 30 passing touchdowns (t-8th most). Julian Edelman has seen double-digit targets in four of his last five games and seven of his last 10. He has at least 69 receiving yards in all but one game since Week 7. Rob Gronkowski has three or fewer receptions in eight of his last nine games. Travis Kelce has at least five receptions in every single game since Week 1 (16 straight games and counting). It’s the longest streak by a tight end in NFL history, and only nine players have longer streaks. Tyreek Hill scored 42.2 DraftKings points against the Patriots in Week 5 with a 7-142-3 line. It was his third-best fantasy performance of the season. Patrick Mahomes averaged 28.2 DraftKings points per game this season, but he has scored fewer than 19 DK points in three of his last four. Coinciding with Mahomes’ recent “slump”? Damien Williams has at least 29 DraftKings points in three of his last four games with at least one touchdown in all four games.